Without even realising it your home can become cluttered. It’s always a daunting thought knowing you have to sort out your clutter to prevent your house becoming a complete mess. Put Away- this box will have everything you want to keep and store at home. This will usually be everyday items and things that are still useful. Give Away- this box will consist of items that you are happy to give away, either to a charity shop or friends/family. Usually these items will be old clothes and toys that you or your kids have grown out of. Storage- this box will have items you still want but don’t have room in your home for them. Storing them in a self storage room means you will still have access to them whenever you need them yet they won’t be cluttering your house anymore. Throw Away- this doesn’t have to be a box, you can easily use a bin bag to eliminate that middle stage. Don’t need it? Throw it out. This is not the only process to reduce clutter. There are plenty of other ways; it’s all about finding the right method for you. Decluttering is easy compared to trying to keep the clutter at a minimum. Cutting clutter out of your life for good isn’t going to happen over night. One option is to have a dedicated clutter space. This can be in the form of a chair in your bedroom specifically for clothes. Having a young family can make keeping the clutter at bay a difficulty. If you make things fun and creative your children are more likely to play along. You can adopt a one in- one out method. For every one item you buy you throw one out. Every time you buy an item throw an unused item out. If you are thinking about reducing your unused items over time then try one in- two out. 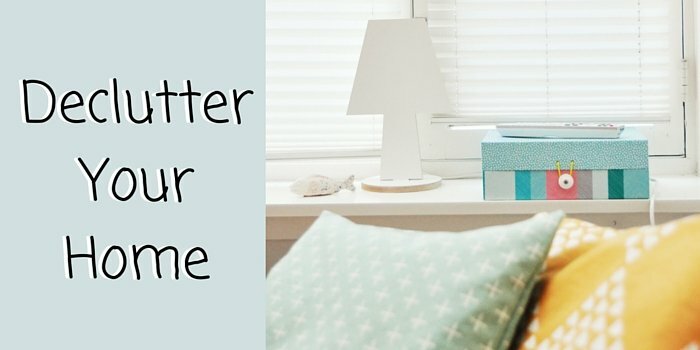 The best and easiest solution, to clutter, is to start small. Begin with one room at a time. This will stop you becoming stressed and possibly giving up before you’ve even made any progress. See how you get on with just one room and then move onto the next. Decluttering can be a lengthy process but will all be worth while in the end. If you run out of storage in your house renting a self storage room is the perfect solution. You can select the size that fits you the best, if you continue to declutter and find more items to store then you can easily upgrade your self storage room.